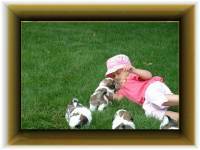 This albumn features available Registerd Champion sired puppies. Last changed on 12/28/14. This album contains 5 items. This album has been viewed 18631 times since 08/28/08. This album features dogs bred by Beswick Kennels or finished by Myself. Last changed on 10/26/11. This album contains 12 items. This album has been viewed 7230 times since 08/19/08. This Album features the ladies at Beswick and some of their children. Last changed on 02/14/05. This album contains 21 items. This album has been viewed 4266 times since 08/19/08. This Album features some of our stud dogs. Click on the Stud to see what he has produced. Last changed on 10/17/08. This album contains 48 items. This album has been viewed 4664 times since 08/19/08. This album pictures young puppies I hope to show later in the year. Last changed on 10/26/11. This album contains 6 items. This album has been viewed 6268 times since 08/23/08.